A man is in custody after barricading himself in a Plymouth home for several hours on Friday night. On Saturday afternoon, Plymouth police said they charged Edward McHugh, 54, with aggravated assault and other charges. The incident yesterday stemmed from an incident at 17 Pembroke Road a week prior. Police said McHugh returned to the home heavily intoxicated. A SWAT team, several armored trucks and K9s responded to the scene just off of Pembroke Road in Plymouth around 6:30 p.m. Friday. 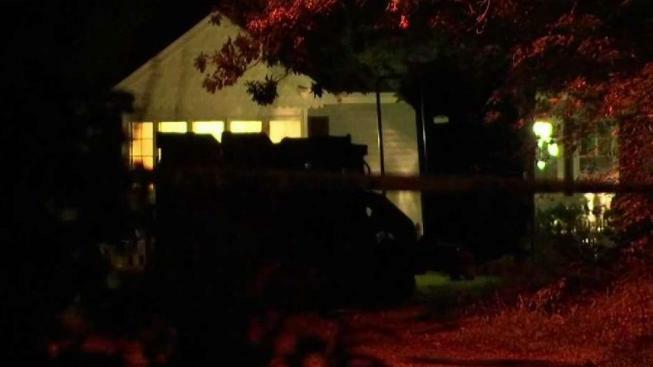 According to officials, the suspect had multiple guns in the house and had barricated himself in the cellar, so they called in the SWAT team. A pregnant woman was reportedly in the home, but law enforcement successfully got her out of the house early on in the standoff. Officials say this was a domestic incident. Several neighbors had to evacuate their homes. Others stood outside anxiously watching the investigation unfold. "They did light it up with lights and they were trying to talk to somebody inside the house but that's... then they shut the lights off, that's all I heard. Then they came out and put the police tape up and that's all I know of," Robert Molloy, a neighbor, said. Another neighbor, John Lynch, says he was on his way home when dozens of state troopers passed him on the road. "I came home and here we are. I pulled into the driveway, heard a couple booms. I didn't know what was going on. I walked up here, it's all blocked off, I don't know what's going on," he said. Police said Saturday that after several hours, McHugh surrendered peacefully.